Tower-building to the highest standards - it's all about the right distance. The object of the game seems very simple: A tower of at least 5 pieces, with one of your own playing pieces on top, brings the win! Dieter Stein has come up with something totally new: It is not the height of the moving tower that indicates how far it may move; instead, it is the destination tower exclusively that determines the moving range. This means also, of course, that playing pieces (towers) on the board may only jump on top of other playing pieces (towers). Only when you place a playing piece do you put it on an unoccupied space. Towers that already exist may be split up. To make things even more perplexing, each player may move any tower, no matter what color its topmost piece has. Only for the win must your own color be on the top of the tower. 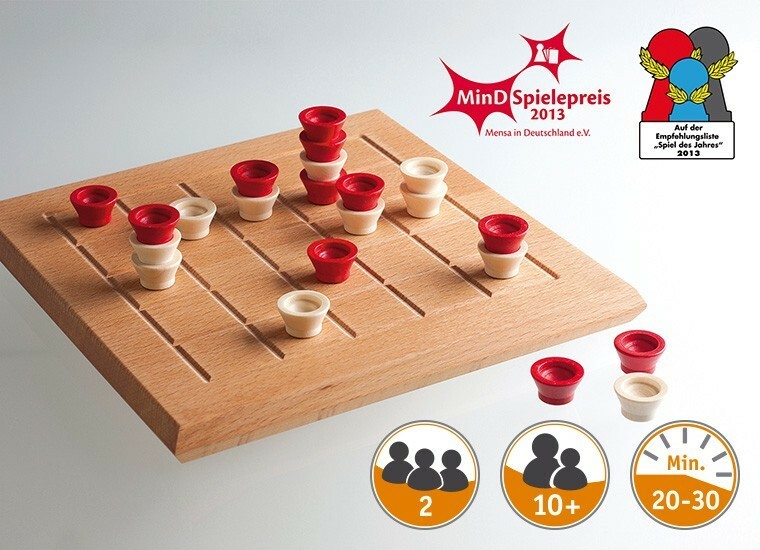 Mixtour is a very demanding strategy game and a wonderful challenge to your own thinking patterns. Warning: Not suitable for children under 36 months! Choking hazard!